Mississippi State linebackers coach Chris Marve has been with the Bulldogs for only a little more than a month. He’s just getting a feel for his guys and what they’re capable of this spring. That said, among the things that have stood out early in Marve’s tenure is a junior hometown hero who could be on the cusp of a breakout year. Former Starkville High School star Willie Gay, Jr. is about to enter his junior season with MSU. He’s already shown flashes of brilliance in his two seasons at State and Marve seems to think what Gay has done so far is just the tip of the iceberg. It’s undeniable that Gay’s star is shining bright these days. In fact, Gay’s future has always been promising. He signed with MSU in 2017 as the top overall defensive player from the state of Mississippi. He was a consensus four-star prospect. Gay’s potential could then be seen early on when he appeared in all 13 games during his true freshman season as he contributed on special teams and as a backup linebacker. Gay finished his debut campaign with 23 tackles, a sack and two tackles for loss. Gay then made a huge step forward last season when he again played in all 13 games and started six. He finished sixth on the team in tackles with 48 and had five sacks and 5.5 tackles for loss. He also had two interceptions and recovered a fumble. As good as the year was, it wasn’t good enough for Gay. He saw a year that exemplified he still has some improving left to do. In 2019, Gay will try to put all the pieces together. One thing is for sure, he’ll have plenty of eyes on him as he does so. 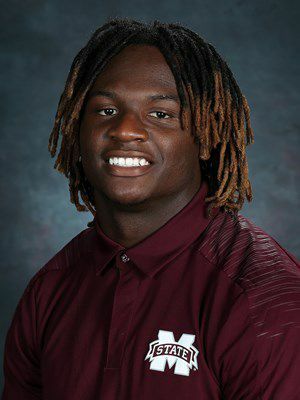 After Mississippi State’s defense lost probable high-round National Football League Draft picks like defensive linemen Montez Sweat and Jeffery Simmons, along with safety Johnathan Abram, the Bulldogs will be relying heavily on their linebackers in 2019 to help pick up the slack those stars left behind. Are Gay and his fellow linebackers feeling any extra pressure this spring? Not at all says Gay. All the while, as State’s linebackers prepare to perhaps shoulder an even heavier load than last year, Gay plans to go about his business trying to get better day by day and showing the work ethic that has caught Marve’s eye. Gay has greatness in mind. Marve indicates he won’t be surprised if Gay gets his wish.